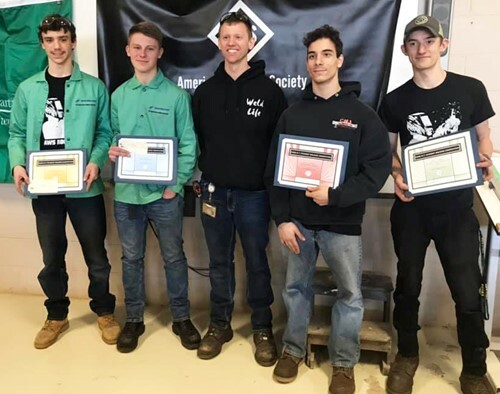 Monroe 2-Orleans BOCES welding students took home some of the top honors at The American Welding Society - Rochester Section Welding Competition in Mount Morris on April 6. This welding competition featured two seniors and two juniors from six BOCES Career and Technical Education centers, including Finger Lakes, Wayne, Eastern Monroe, and Monroe 2-Orleans BOCES Career and Technical Education (CTE) centers, as well as the Mount Morris and Batavia CTE centers. First place, Junior Competition: Trent King (Greece Odyssey). Trent also won Best Visual Junior. He received a check for $500. Second place, Senior Competition: Nick Romano (Hilton). Nick received a check for $250 and a $1,500 scholarship for post-secondary education. Third place, Junior Competition: Gage Vogt (Brockport). Gage received a check for $100. In addition to these awards, senior Jordan Sobolew (Wheatland-Chili) received a $3,500 scholarship from Ohio Tech. Each of the students received close to $200 worth of welding equipment. Photo: (left to right) Gage Vogt, Trent King, BOCES 2 CTE welding teacher Josh Padlick, Nick Romano and Jordan Sobolew.